Here’s a joke among tattoo artists that whenever Rihanna gets a new tattoo, droves of 20-something women will soon come asking for the same. A few years ago, the singer adorned the upper portion of her left ear with the outline of a star. Not many came asking then, but, in what seems to have been a self-fulfilling prophecy, more are now. “Anytime there’s a condensed spot, where one little tattoo makes the whole spot look filled up, that’s where the trends come from,” said Brad Stevens, a tattoo artist at New York Adorned in Manhattan, who said he tries to dissuade many people from getting visible tattoos, sometimes dissuading them altogether. As Ms. Kuykendall discovered from her experience, the ear anatomically differs drastically among people. The top part of the ear has the most tattoo-able surface area, composed of the scapha (the flat part near the outer flap at the top) and the crus of the antihelix (the raised ridge closer to the middle). Scaphas that flow into unprotrusive cruras make for ideal canvases. 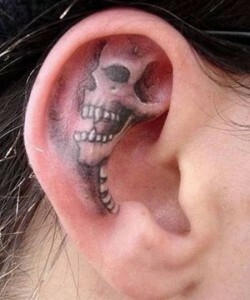 Smaller, highly ridged ears are hardly tattoo-able at all.